Despite his untimely death in 1667 at the age of thirty-seven, Gabriel Metsu left an astounding collection of history paintings, portraits, still lifes, and exquisite genre scenes. These charming depictions of kitchen maids, elegant young ladies, hunters, drinkers, and amorous couples have gained Metsu a place among the most celebrated painters of 17th-century Holland. His work ranges from group portraits of the families of wealthy merchants, to wistful portraits of single women and bustling genre scenes of markets and taverns. Meeting the demands of the early Dutch art market, Metsu mastered a number of different artistic styles. However, Metsu's biography has remained largely enigmatic. This absorbing book provides insight into his life and details the network of personal and professional connections that influenced him. 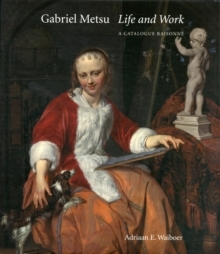 Following the successful exhibition of the artist's work last year, this book promotes greater understanding of the full range of Metsu's career, and the catalogue raisonne provides a detailed and informative record of his entire known oeuvre. Pages: 408 pages, 78 color + 170 b-w illus.